The United States Department of Agriculture and similar agencies throughout the world use food pyramids to represent the portions of each food group you need to be healthy. 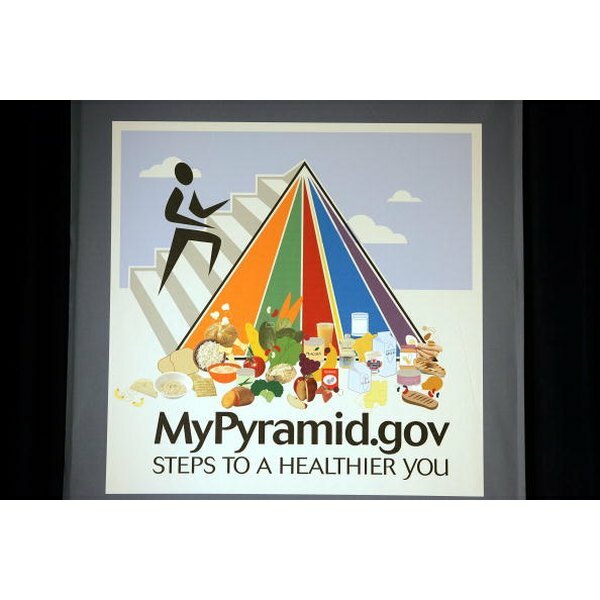 Because athletes have different nutritional needs than non-athletes, food pyramid guides have been modified to show athletes what they should consume. In order to perform well, endurance athletes need to fulfill their energy, carbohydrate, protein and fat requirements. Endurance athletes do not need to eat more fruits and vegetable than non-athletes. Food guides recommend that everyone eats at least three servings of vegetables and two servings of fruit a day. According to the Swiss Society for Nutrition, it is okay to eat more than this recommended number of servings, but it may cause some athletes to experience gastro-intestinal problems. Grains are an important part of an athlete’s diet because they are the primary source of carbohydrates used for energy. Because whole grains are more nutritious than refined grains, they should be eaten more often. The recommended amount of carbohydrates for endurance athletes is about 6 to12 g per kg of body weight. This is based on the assumption that endurance athletes exercise at an intensity that is at least 70 percent of their aerobic capacity for more than 1 hour a day. Athletes can also eat refined sources of carbohydrates such as sports drinks and energy bars, to fill more immediate energy demands. Dairy, meat and eggs are sources of protein, calcium and fat. Although athletes have higher protein requirements than non-athletes, they do not need to increase their intake of these food groups. According to a Swiss study published in the 2008 issue of the “International Journal of Sports Nutrition and Exercise Metabolism,” athletes can fulfill their protein requirements by eating the recommended servings of meat, dairy and eggs, along with grains that contain protein. Many sports drinks and bars also contain protein to fill the demand. Oils are a liquid form of fat that comes from plants. They are important dietary sources of essential fatty acids that you need for proper cell function and health. Athletes need more healthy fats than non-athletes because they have higher energy requirements. They should eat an additional half serving of oil for each hour of exercise by adding cooking oil to their food and eating nut products.